My Gettysburg installation was part of a group exhibition at “Ruburbs and Other Spaces in Between” at The Athens Institute for Contemporary Art in Athens, GA. The installation functioned as a kiosk for contemporary Gettysburg, while subverting the grand historical narrative and heroic landscape visions commonly associated with the site, offering new interpretive possibilities. Elements included a wall map with images of alternative monument designations, mock tourist video, Civil War artifacts and a postcard rack containing my Historical Amnesia line of cards. The interweaving of personal memory and experience versus historical narrative are part of my ongoing work in alternative process photography, particularly 19th century wet plate collodion. For Review of Ruburbs: The Athens Banner-Herald. Quote from the review: In the installation “Gettysburg,” Bryan Hiott, an artist from New York City, has created a portable tourist kiosk of the town, but rather than featuring historic landmarks, the images in his photographs, video and “Historical Amnesia” line of original postcards are of street curbs, a FedEx drop-off box, balding patches of grass and pale expanses of dirt and concrete.His work shows the collision of past and present: in one of his videos, re-enactors fire their muskets in Civil War dress as traffic whizzes by the large hotel in the background. My color photographs and video are part of an ongoing exploration of culturally significant landscapes. At Gettysburg, Pennsylvania, where the pivotal engagement of the American Civil War was fought in July of 1863, I began my work with a walking tour of the battlefield monuments, referring occasionally to the National Park Service map. However, along the periphery, my understanding of the past became dislodged as I encountered contemporary, commercially manufactured forms that seemed to function as monuments in their own right. I searched for a way to reconcile my understanding of the past with those present day elements. Historians have written that the Civil War defined America as a modern industrial nation; and that perspective became important to the direction of my project. It seemed likely that the legacy of Gettysburg was to be found not so much among battlefield monuments to the heroic dead as among contemporary forms in close proximity. Using multiple photographs of those forms, I mapped the terrain according to my own experience and built a visual composite that might facilitate new interpretations of Gettysburg. Each viewer’s historical understanding and expectations of the location will play a vital role in interpreting my work, which is a negotiation of how much of the past we might retain in the present. To open a discussion with the public about the cultural legacy of the Civil War and how well we may reconstruct the past, I created Historical Amnesia Postcards, representing new monuments for battlefield locations. This line of postcards was launched at Gettysburg in select museums, visitor centers and tourist shops alongside postcards depicting officially recognized monuments and commanding officers from the battle. At first glance Historical Amnesia Postcards may appear to blend in among so much other tourist information. It is only upon closer inspection that one might become disoriented by the forms they depict, raising questions about the culture that produced them and what their presence means in relation to “historically significant ground.” This project is ongoing. 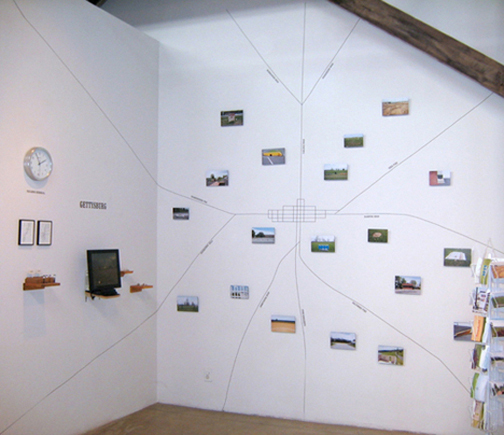 Installation view of The Angle (Storm Drain Monument).